Photo: Euro competition…Mill Green students with their German guests on sports day. 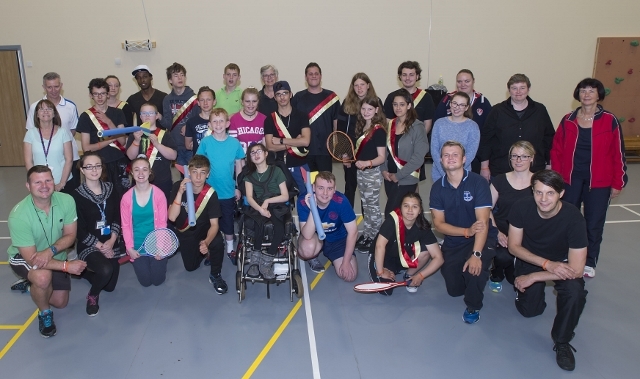 Mill Green Special School welcomed pupils and staff from twin town Stuttgart’s Gustav Werner School for a week-long visit – which saw the overseas visitors take part in sports day and enjoy a party to help celebrate the Queen’s birthday. The two schools regularly take part in exchange visits, with the German party this year getting their first look at Mill Green’s new premises in Parr. A total of 12 pupils made the trip to the UK, accompanied by seven members of staff. Queen’s birthday party highlights included games, mask making and performances by local brass bands. There was also a motivational talk by local war hero Andy Reid, who took time out to speak to pupils individually – inspiring them with accounts of his own experiences.